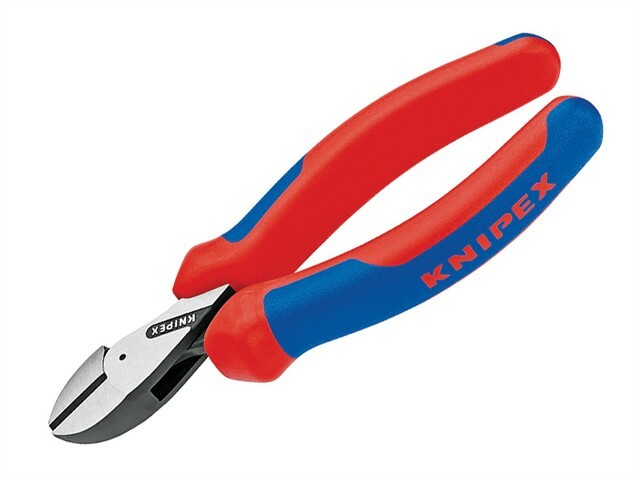 The Knipex 73 02 160 X-Cut is a multi-talented all-rounder cutting plier with soft-grip handles, it has a box joint design and is compact, light and simultaneously powerful and highly precise. With its wide range of cutting abilities, it offers versatility in industry, trades and crafts. The X-Cut cuts through the finest strands with great precision, has the force required for easy cutting hard piano wire, and features a large jaw opening for multi-stranded cables. When cutting a medium-hard wire (Ø 3 mm) the X-Cut requires about 20% less force than a conventional diagonal cutter of the same size. Further user-friendly advantages are provided by the box joint design with easy, zero-backlash movement and a slim head shape for easy access even when working in confined areas. This KNIPEX innovation provides professionals from industry, trades and crafts with a general-purpose diagonal cutter to meet the most varied cutting requirements in a metalworking shop or an electrical workshop. The X-Cut is compact and light but nevertheless heavy-duty and sturdy – it is the new all-rounder among the diagonal cutters.